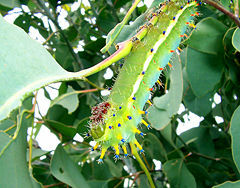 Caterpillar of the Emperor Gum Moth, Opodiphthera eucalypti. A caterpillar is the larval stage of a member of the order Lepidoptera (the insect order comprising butterflies and moths). They are essentially eating machines, mostly consuming leaves and other plant material (phytophagous), with some species eating other insects (entomophagous), spending most of their time in search of food. Caterpillars grow through a series of molts and each intermediate stage is called an instar. Near the end of each instar, the larva undergoes a process called apolysis, in which the cuticle, the tough covering that is a mixture of chitin and specialized proteins, is released from the epidermis and the epidermis begins to form a new cuticle beneath. At the end of each instar, the larva molts the old cuticle, and the new cuticle rapidly hardens and pigments. Development of wing patterns begins by the last larval instar. Living organisms, without exception, develop through stages. 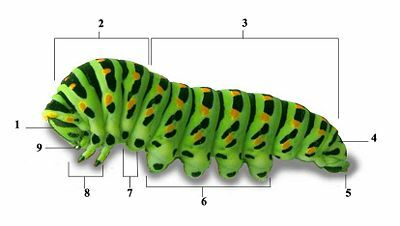 In the case of the caterpillar, the larva stage is dramatically different from the adult stage. The change is commonly captured as a religious metaphor regarding eternal life or spiritual renewal, such as the emergence of a soul or spirit after death, or a new person after a spiritual trial, the way that an ethereal butterfly emerges from the pupal stage after the seeming death of the caterpillar. Being voracious feeders, many caterpillars are considered as pests in agriculture. Many moth species are better known in their caterpillar stages because of the damage they cause to fruits and other agricultural produce. A geometrid caterpillar or inchworm. Most caterpillars have wormlike, tubular bodies. They have three thoracic segments and ten abdominal segments, giving 13 segments in total. On the thorax, they have three pairs of true legs. On the middle segments of the abdomen, they have up to four pairs of prolegs, and often a single pair of prolegs on the last abdominal segment. The families of lepidoptera differ in the numbers and positioning of the prolegs. The geometrids, also known as inchworms or loopers, are so named because of the way they locomote, appearing to "measure the earth" (the word geometrid means earth-measurer in Greek); the primary reason for this unusual locomotion is the elimination of nearly all the prolegs except the clasper on the terminal segment. Equipped with appendages at both ends of the body, an inchworm will clasp with its front legs and draw up the hind end, then clasp with the hind end (prolegs) and reach out for a new front attachment—creating the impression that it is measuring its journey. Caterpillars have soft bodies that can grow rapidly, like balloons, between molts. Only the head capsule is hardened. In caterpillars, the mandibles are tough and sharp for chewing leaves; in most adult Lepidoptera, the mandibles are highly reduced, or soft. Behind the mandibles of the caterpillar are the spinnerets, for manipulating silk. Actias selene with some of the spiracles identified. Close-up of a caterpillar face showing inverted Y suture. Some larvae of the Hymenoptera order (ants, bees, and wasps) can appear like the caterpillars of the lepidoptera. These are mainly seen in the sawfly family. While the sawfly larvae superficially resemble caterpillars, they can be distinguished by the presence of prolegs on every abdominal segment. Another difference is that lepidopteran caterpillars have crochets or hooks on the prolegs, while these are absent on the sawfly larvae. A further difference in lepidopteran caterpillars is the upside down Y shaped suture on the front of the head (Scoble 1995). The larvae of sawflies differ also in having prominent ocelli on the head capsule. Like all insects, caterpillars breathe through a series of small openings along the sides of their thorax and abdomen called spiracles. These branch into the body cavity into a network of tracheae. Caterpillars have about 4,000 muscles (the human being has only 629). They move through contraction of the muscles in the rear segments, pushing the blood forward into the front segments elongating the torso. The average caterpillar has 248 muscles in the head segment alone. Caterpillars do not have good vision. They have a series of six tiny eyelets or 'stemmata' on each side of the lower portion of their head. These can probably form well focused, but poorly resolved images (Scoble 1995). They move their heads from side to side probably as a means of judging distance of objects, particularly plants. They rely on their short antennae to help them locate food. Some caterpillars are able to detect vibrations, usually at a highly specific frequency. Caterpillars of the common hook-tip moth, Drepana arcuata (Drepanoidea), produce sounds to defend their silk nests from members of their own species, by scraping against the leaf in a ritualized acoustic duel (Yack et al. 2001). They detect the vibrations conducted by the plant and not air-borne sounds. In a similar manner, cherry leaf rollers, Caloptilia serotinella, defend their rolls (Fletcher et al. 2006). Tent caterpillars can also detect vibrations at the frequency of wing beats of one of their natural enemies (Fitzgerald 1995). Caterpillars, being protein-rich, are a source of food for many species of animals. In turn, caterpillars have a variety of defenses against predation. Some caterpillars have large false eyes towards the rear of their abdomen. This helps convince predators that their back is actually their front, giving them an opportunity to escape when attacked. Others have a body coloration that closely resembles their food plant, or common objects in the environment, such as bird droppings or twigs. Many feed in leaf mines, ties, rolls, or silk galleries. Others will use startle or intimidation, with the sudden presentation of eyespots or snake mimicry. Some species use a silk line and drop off the branches when disturbed. Some caterpillars will regurgitate acidic digestive juices at attacking enemies. Many papilionid larvae produce bad smells from extrudable glands called osmeteria. More aggressive self-defense measures are taken by hairy caterpillars. These caterpillars have spiny bristles or long fine hair-like setae with detachable tips that will irritate by lodging in the skin or mucous membranes (Scoble 1995). However, some birds, like cuckoos, will swallow even the hairiest of caterpillars. The most aggressive defenses are those of the many caterpillars that have bristles associated with venom glands, called urticating hairs. One of these is among the most potent defensive chemicals in any animal; it is produced by the South American silk moth genus Lonomia. The defensive chemical is an anticoagulant of such potency that it can kill a human, causing them to hemorrhage to death (Malaque et al. 2006). This chemical is being investigated for potential medical applications. Most urticating hairs, however, range in effect from mild irritation to dermatitis. Some caterpillars eat the leaves of plants that are toxic to other animals. They are unaffected by the poison themselves, but it is sequestered in their body, making them highly toxic. These chemicals are also carried on into the adult stages. These toxic species, such as the Cinnabar moth (Tyria jacobaeae) caterpillars, are usually advertised with bright stripes or colors in black, red and yellow—the danger colors. The aim of all these aggressive defense measures is to assure that any predator that eats (or tries to eat) one of them will learn and avoid future attempts. Some caterpillars obtain protection by associating themselves with ants. The Lycaenid butterflies are particularly well known for this. They communicate with their ant protectors by means of vibrations as well as chemical means (Travassos and Pierce 2000). Some caterpillars are gregarious and such aggregations are believed to help in reducing the levels of parasitization (Entry and Dyer 2002). 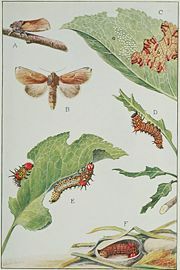 Life cycle of the (Schizura concinna), known as the red-humped caterpillar. Caterpillars have rightly been called eating machines. Their energy is devoted toward eating and growth. They eat leaves voraciously, shed their skins generally four or five times, and eventually pupate into an adult form. Measured by weight increase, caterpillars have a very fast growth rate. For instance, a tobacco hornworm will increase its own weight ten thousand times in less than twenty days. One of their adaptations that enables them to eat this much is a mechanism in a specialized midgut that transports ions at a very high rate to the lumen (midgut cavity), to keep the potassium level higher in the midgut cavity than in the blood (Chamberlin and King 1998). Caterpillars are predominantly herbivores: 99 percent of species feed on plants. A few feed on detritus, including the clothes moth. Of those that are predatory, most feed on eggs of other insects, such as aphids, scale insects, or ant larvae. Some are cannibals, and others prey on caterpillars of other species (e.g. Hawaiian Eupithecia ). A few are parasitic on cicadas or leaf hoppers (Pierce 1995). Some Hawaiian caterpillars (Hyposmocoma molluscivora) use silk traps to capture snails (Rubinoff and Haines 2005). Caterpillars are of immense economic importance. They can both cause extensive damage and help in production. The silkworm is a caterpillar that has spawned an entire industry, the silk industry. On the other hand, many caterpillar species, such as the Cotton bollworm, are known to cause enormous losses to farmers. The gypsy moth is an example of caterpillars that damage trees, being a pest of hardwood trees in the Eastern United States. Caterpillars have been the target of pest control through the use of pesticides, biological control, and agronomic practices. Many pest species have become resistant to pesticides. Bacillus thuringiensis is a soil-dwelling bacterium that also occurs naturally in the caterpillars of some moths and butterflies. It produces a toxin that has specificity against species of the orders Lepidoptera (moths and butterflies), Diptera (flies and mosquitoes), and Coleoptera (beetles). This information has been used in producing sprays of bacterial spores, toxin extracts, and also by incorporating genes to produce them within the host plants. Because of their specificity, these pesticides are regarded as environmentally friendly, with little or no effect on humans, wildlife, pollinators, and most other beneficial insects. Host plants themselves have mechanisms of resistance to herbivory by caterpillars and these include chemical toxins and physical barriers such as hairs. 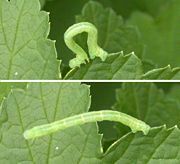 Incorporating host plant resistance (HPR) through plant breeding is another approach used in reducing the impact of caterpillars on crop plants. Chamberlin, M. E., and M. E. King. 1998. Changes in midgut active ion transport and metabolism during the fifth instar of the tobacco hornworm (Manduca sexta). J. Exp. Zool. 280: 135-141. Entry, G. L. G., and L. A. Dyer. 2002. On the conditional nature of neotropical caterpillar defenses against their natural enemies. Ecology 83(11): 3108–3119. Fitzgerald, T. D. 1995. The tent caterpillars. The Cornell series in arthropod biology. Ithaca, N.Y.: Comstock Pub. Associates. ISBN 0801424569. Fletcher, L. E., J. E. Yack, T. D. Fitzgerald, and R. R. Hoy. 2006. Vibrational communication in the cherry leaf roller caterpillar Caloptilia serotinella (Gracillarioidea: Gracillariidae). Journal of Insect Behavior 19(1): 1–18. Malaque, C. M. S., L. Andrade, G. Madalosso, S. Tomy, F. L. Tavares, and A. C. Seguro. 2006. A case of hemolysis resulting from contact with a Lonomia caterpillar in southern Brazil. Am. J. Trop. Med. Hyg. 74(5): 807-809. Pierce, N. E. 1995. Predatory and parasitic Lepidoptera: Carnivores living on plants. Journal of the Lepidopterist's Society 49(4): 412-453. Rubinoff, D., and W. P. Haines. 2005. Web-Spinning caterpillar stalks snails. Science 309(5734): 575. Scoble, M. J. 1995. The Lepidoptera: Form, Function and Diversity. Oxford: The Natural History Museum in association with Oxford University Press. ISBN 0198549520. Travassos, M. A., and N. E. Pierce. 2000. Acoustics, context and function of vibrational signalling in a lycaenid butterfly–ant mutualism. Animal Behaviour 60: 13-26. Yack, J. E., M. L. Smith, and P. J. Weatherhead. 2001. Caterpillar talk: Acoustically mediated territoriality in larval Lepidoptera. Proceedings of the National Academy of Sciences USA 98(20): 11371–11375. All links retrieved January 18, 2017. This page was last modified on 18 January 2017, at 15:45.